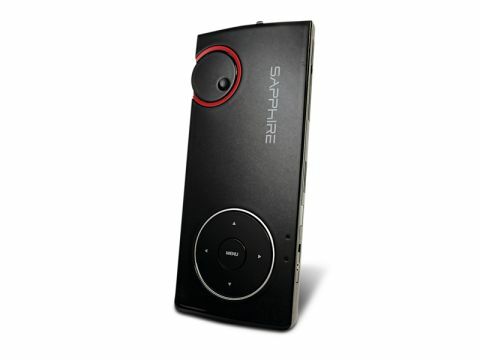 One day, all mobile phones will have something similar to the Sapphire Mini Projector 101 built in. In fact we won't even be calling them mobile phones by then, so omnipresent they'll surely become. Who knows, maybe they'll simply be embedded in our foreheads, and we'll receive a 6G signal directly to our frontal lobes. For now, though, we have to make do with the Mini Projector 101, a projector that's the size of a mobile phone. I for one can just about put up with that. Okay, I realise that it only outputs at the ol' school VGA mode of 640x480, but hell, that's good enough for a little bit of projected action on the move. Now I'm not going to lug a full projector around with me on holiday, as much of a techno-obsessive as I am, but being able to slip one of these into your suitcase means you can forget about rubbish foreign telly on your travels. The battery is a little limited, too. And you'll have to fill your boots with sub-two hour movies if you want to watch them unplugged from the mains. In a decently darkened room, though, you'll get a fairly good image. And the upscaling to your laptop res is fine for the odd non-HD video. The stumbling block is the price. If it were a professional PowerPoint projector to lug around meeting after meeting, you could justify the £200+ price tag. Unfortunately, it just isn't clear enough without blackout curtains. As such, it's a lot of cash to spend on something that's just going to be slung in the overnight bag or holiday suitcase.